Strange as it might seem, there is no easy answer to who created the first computer. If you talk about the first digital computer then the answer has to be the ENIAC or Electronic Numerical Integrator And Computer which was developed in 1946 by two inventors, J. Presper Eckert and John Mauchly at the University of Pennsylvania. Many people believe that the ENIAC was not really first, because a professor called John Vincent Atanasoff and graduate student Cliff Berry created the ABC or Atanasoff-Berry Computer in 1942. A judge ruled that the patent name, ENIAC was invalid and awarded the prize for the first digital computer to Atanasoff. Go figure. Although the judge rules the ABC the first digital computer, many still believe that the ENIAC was the first digital computer ever invented. As you can see from the picture above it was quite a serious piece of hardware. It stood about 1,800 square feet and used about 18,000 vacuum tubes, weighing almost 50 tons. It was time consuming to program and power hungry. 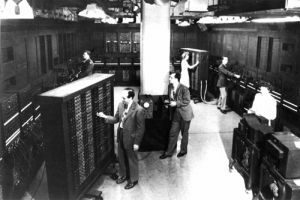 The ENIAC was designed to calculate artillery firing tables for the United States army, but it's first use was calculations for the hydrogen bomb. Scary stuff. After the ENIAC things started developing more quickly and a host of "The first" in computers started. The first computer with RAM or Random Access Memory appeared in 1955 and was called the Whirlwind machine. Then the first computer that used transistors appeared in 1956 and was called the TX-O. The first mini computer appeared in 1960 and was developed by DEC or Digital Equipment Corporation. 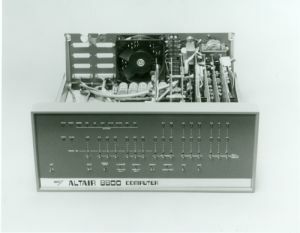 The first PC or Personal Computer, as it was coined, was developed by Ed Roberts and was named the Altair 8800 in 1975. The Altair 8800 also made use of the Intel 8080 processor produced by Intel in the 1970's. When I look back at the history of computers, it amazes me that these machine were actually sold and used. Then I realize that I myself used a Intel 286 PC long time ago and at the time it was one of the best. Remember that the operating system and programs were not as demanding as today. The graphics weren't that good and storage was a luxury. I think that in those days the guys actually knew how to program efficiently. They had very limited resources to work with and they had to find ways around problems like storage space and processor power. Today, if programmers run into these problems, it seems they only throw more hardware at it. I might be wrong. I just feel that the programming magic has somewhat gone today because of the power of the systems today. It's all about graphics and visuals. So, spare a thought for the pioneers of the old days. They really made computers easier and more accessible for us all.